There are 35 stamps matching your search. 50c Numeral of Value Cubiertas Gummed Label for Insured Letters. Unused with small tear at top and top left corner clipped. 30c Coffee Overprinted 15 cts and 40c Coffee Overorinted 15 cts. 1P National Library at Bogota. 35c Old and New Ships of Barraquilla, 35c Arms and View of San Gil, 35c Hotel Popayan, 1.45P View of Velez and Inscribed Extra Rapido 10c Statue of Christ in Procession. 35c Barranquilla Arms, 40c Popayan Arms, 1P Arms and View of San Gil and 1P Holy Week in Popayan and 50c Old and New Ships of Barranquilla, 50c Hotel Popayan, 50c Bucaramanga Arms and 50c Holy Week in Popayan Se-tenant Souvenir Sheets. 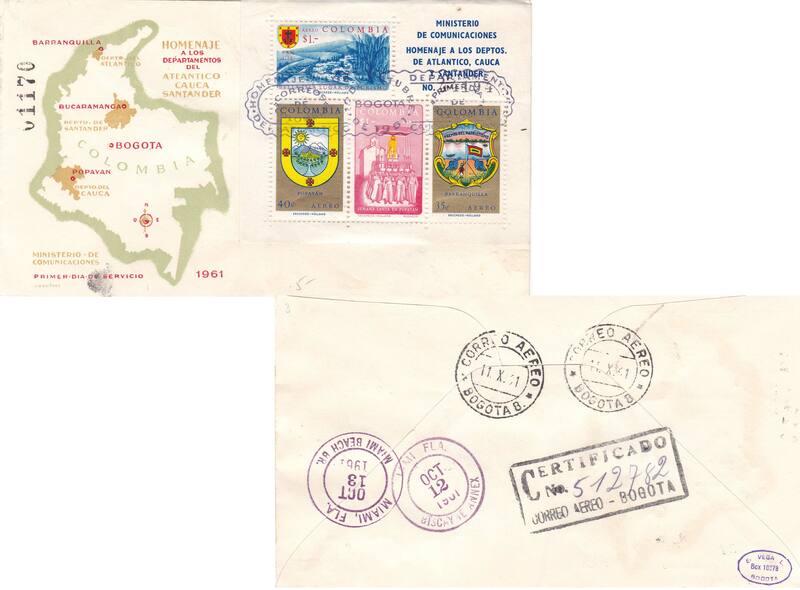 35c, 40c, 1P and 1P Departments of Atlantico, Cauca and Santander Souvenir Sheet 1961 Bogota Primer Dia Registered to Miami, Florida. First Day. Mosdossy Cachet. 10c Numeral of Value in Circle Tolima Local Cubiertas Label for Insured Letters. 5c Numeral of Value in Circle Tolima Local Cubiertas Label for Insured Letters. Unused with crease and thins.